The Castlewood is a senior living community that specializes in encouraging independence for all residents. We offer a range of services and amenities that enable our residents to continue to remain independent, with the reassurance of on-site help when needed. The Castlewood Senior Living has several floor plans and offers one or two bedroom options from which residents can choose. The Lodge is the epicenter of The Castlewood and provides many independent living options. Care services are available for those requiring additional assistance with daily activities. Convenience and safety are as important to The Castlewood as they are to you and your family. For this reason, we provide 24-hour nursing, free scheduled transportation, and on-site dining. Everything you need is within your reach! Our highest priority at The Castlewood Senior Living is to provide our residents with a sense of home. For those who need a higher level of care, we maintain private studio apartments within the cozy Memory Care cottage. This area provides residents with personal space yet caters to their specific needs, including companionship from caregivers. Whether at the crack of dawn, working hours, or in the middle of the night, aid is available at all times. The Castlewood provides its residents and their families with peace of mind and assurance that if a situation arises, it is handled quickly and appropriately. The Castlewood Senior Living, nestled on the doorstep of the Wicklow Subdivision and surrounded by attractively landscaped grounds with mature trees is designed to meet the needs of seniors in Christian County. This moderately priced community is the first modern senior campus of its kind in Nixa. Upgraded amenities designed for aging in place set the standard at The Castlewood. Features include modern technology to meet the communications needs of the new generation of tech-savvy baby boomers, as well as to support operational systems that help deliver services more efficiently. Energy-saving features include blown exterior insulation, efficient appliances, and light controls. No matter the level of attention you may require, every member of our team is ready to provide services that will fit your needs and lifestyle. 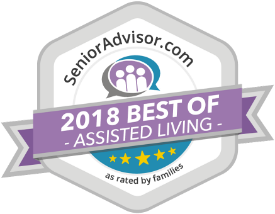 Whether residing in the Independent Living, Assisted Living, or Memory Care apartments, you will receive exceptional service and attention from The Castlewood staff. In addition to residents’ private apartments, The Castlewood Senior Living community has beautiful common areas for on-site activities such as watching movies in the theater, taking cooking classes in the provincial kitchen, and exercising in the state-of-the-art fitness center and training studio or using the outdoor LifeTrail equipment. These are just a few of the options available to all residents and you are encouraged to take full advantage of all the activities, programs and luxuries our community has to offer. With so much to choose from, residents are certain to find what suits their interests. Health and wellness are two of the most important aspects of life. That’s why, The Castlewood assists its residents by promoting healthy aging. Our custom LifeTrail fitness equipment is designed with seniors in mind and provides an outdoor exercise routine that can be completed at your own pace. The indoor training studio and fitness center are always open, as well. With a slew of scheduled group classes, residents are sure to find something that suits their interests. To ensure an active mind and spirit, you may spend time reading books, solving complex jigsaw puzzles or just engaging in conversations with all your new friends at The Castlewood. We are confident that you will find our entire community to be charming, welcoming, and relaxing. Reserve your spot at The Castlewood Today!